Anna Morgan was a “chorus girl” and had a dressing room where she would use to dress for the next performance. She shared it with many other chorus girls such as her friend Laurie, her influence of becoming a better performer and feel accepted into society. 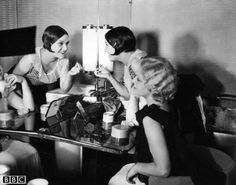 The dressing-room represented her escape from society idea of women and her interacting with other women to feel empowered by them. They would encourage each other or a specific person, as for Anna she described it as a cold room. According to the article, Performance and the Reflected Self: Modern Stagings of Domestic Space, 1860-1914″ Kinchin states “actual room settings are modes of representation present alternatives modes of entering the complex aesthetic, symbolic, spatial world of the interior.” (64) Demonstrating that places or rooms can reflect on a person’s being and what it symbolizes within their life. As for Anna, the dressing-room symbolized her escape from the real world and being able to value her own beauty. But she still felt shameful of what she did but throughout the novel, she grew out of her comfort zone to do what she liked. Later in the novel, she no longer was inside a dressing room but had her own apartment. As I can see Anna idea of a dressing-room was first miserable and later was turned into an apartment because of a man named Walter providing it. Juliet Kinchin, “Performance and the Reflected Self: Modern Stagings of Domestic Space, 1860-1914,” Studies in the Decorative Arts 16, no. 1 (Fall-Winter 2008-2009): 64-91.